That’s Lightroom 2 on the screen. When I took the picture I was engaged in applying keywords to photos. 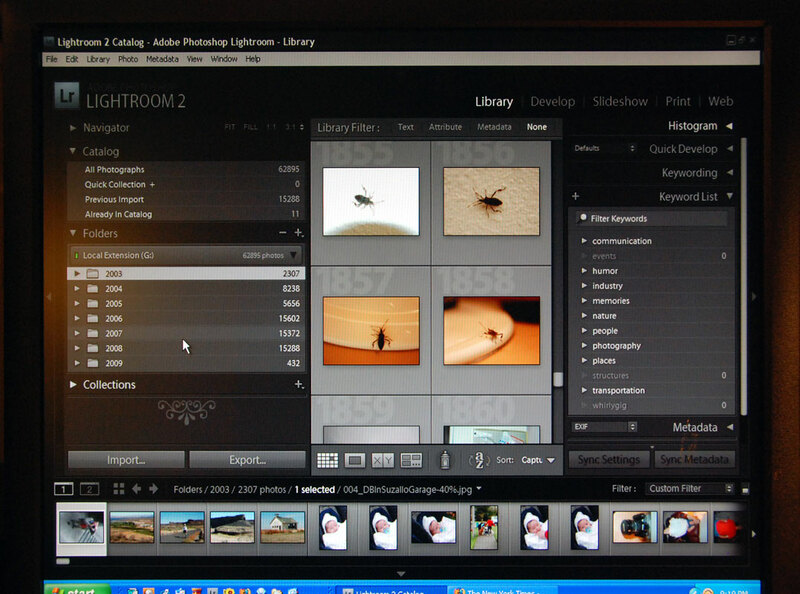 The use of Lightroom is the method I use for organizing digital images. Images are organized by date on my hard drive and imported into the Lightroom database, where I then apply keywords that are the basis for image searches. The left side of the screen shows the date-oriented folder structure on my hard drive. The 2003 folder is selected. The middle section shows images in the selected folder. On the right is the keyword list, with only the highest-level words visible. Other keywords are nested below them. The use of Lightroom made it pointless to continue to add image data to the Word file I had been using, so it became static---it gets no new image data. However, it is still used for finding film images about subject X or day Y. All images are copyright 1966 - 2015 by Dave Beedon (davebeedon AT comcast DOT net). Forgot to mention it's freeware. Found an aplication that removes duplicate images based on image data.http://www.keronsoft.com/dupdetector.html. I used it an found a couple thousand duplicates. Steve, your report is "very disturbing" (not merely "disturbing"), but I take solace in knowing that from this point, things can only get better. Onward and upward! Dave, you overlooked the fine print, "Excessive use of this product has been associated with an increase in mental disturbances, with an as yet unexplained spike in the Renton, Washington area." Regarding the main bug, I always suspected that Kafka's "Metamorphasis" was based on an actual incident, to be repeated at some unknown time in the future. The baby belongs to a former neighbor. Please don't mention that idiot "octomom." The bug belongs to Mother Nature; it did not glow. The computer's main bug sits at the keyboard; efforts to remove it have been unsuccessful. An undocumented feature of tagging zillions of images with Lightroom is its ability to drive a person crazy. Five babies--are you competing with the octomom? One of the bugs is glowing--lightning bug! Dave, I think your computer's picked up a few bugs. Not to mention a baby. Thanks, Larry. I'll be a bit grayer when I re-surface. Good luck, Dave. See ya in a couple light years.